Being a work-at-home mom, I find myself performing multiple tasks every day. I give my son a bath and prepare him for school every morning before I work. When he comes home from school and after he’s had his lunch, we sit down together to review for his lessons/tests for the next day, then I resume work. I also blog on the side, plus I have to keep tab on my son’s other activities in school, our medical check-ups, important events we have to attend, and family and friends we have to visit. With so many things to think about at work and at home, I tend to forget a lot of things, and I finally came to the realization that I can’t do everything on my own. I need to be more efficient and more organized. I think I just found the perfect sidekick to help me accomplish everything I need to do. I’m heading over to the Mommy Mundo Bazaar at the Rockwell Tent on November 24 and 25, 2012 to get my copy of the Mom 24/7 2013 Planner. •	It contains health record pages for the entire family, a family vacation planner and party planning pages. •	It has designated sections for money matters, grocery lists, menu planner, household help records. •	It has a special portion for mom’s personal development. •	It has a menstrual tracker. •	It shares women’s experiences of motherhood at the topmost part of every page. 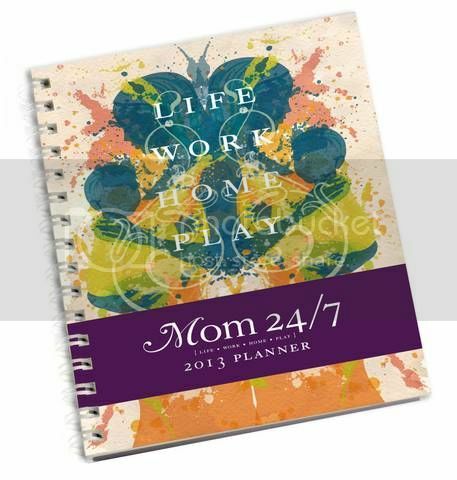 Each Mom 24/7 2013 Planner contains coupons from Mommy Mundo partners so make sure to grab a copy. Enjoy discounts and freegoodies from All Flip-Flops, Lactacyd Toddler Tubs, Smart Explorers, Silly Monkey Clothing, Bug & Kelly, Mommy Matters, Natural Origins, Baby & Beyond, Philips Avent, Cycles and Cradles, Tiny Buds, Fun Ranch and Dentiste. The Mom 24/7 2013 Planner will be available at the following retailers by third week of November: Fully Booked, National Bookstore, Hobbes &Landes, Numa, Medela House, Momtrepreneur Shop, and online through www.shopmommymatters.com, and Indigo Baby. For more info visit www.MommyMundo.com/mom247planner2013, email info@mommymundo.com, or text 09178162524. This entry was posted in Mom 24/7 2013 Planner, Mommy Mundo. Bookmark the permalink. Planner is what I need because I am not organized and I always forget to do things if I don’t write them down. I will surely get one for myself. I’m still having second thoughts if I’m going to buy this planner or just wait and complete my CBTL stamp card. I like the usefulness of this planner but it looks heavy. ← Are You Ready for Mommy Mundo Christmas Bazaar 2012?